As I set out for my weekly walk around our 1/2-mile Promenade pathway, I was greeted by the usual suspects – cardinals chirping, red-wing blackbirds chattering, and several pairs of ducks, each enjoying their morning quacks. While the weather has been anything but Spring-like, there are signs – some gorgeous daffodils, irises, and crocus blooming for the world to see. As I worked my way around the Promenade (I was headed clockwise), I’m very pleased to see a new growing bed being installed just north of the large water storage tanks, approaching the Water Celebration Garden. This new undulating space will provide interest, perennial plantings, and reduces the amount of turf to maintain (which can be especially tricky around trees and difficult-to-maneuver tight spaces). From the bridge, it was easy to see how low Swan Pond’s water level is – – we cut off the flow into Lotus Pond (which feeds Swan Pond) from Christiana Creek to make necessary repairs to the concrete footers supporting the beautiful wooden bridge connecting the Elk Garden to the Island Garden [under construction]. During the floods, the footers were undercut and sank ever-so-slightly on one corner; the repairs will not only fix the problem but are preventative for future flood activity. The Children’s Garden is coming along wonderfully! Structures are being built, water features installed, a new boardwalk over South Pond, and a gorgeous new ‘banner’ sign (and sculptures) mark the entry plaza to this amazing new space – – a gift from The Rex and Alice A. Martin Foundation – – scheduled to open in June. A lot of work to do, but looking GREAT! Along the West Promenade – – be aware of aggressive geese. Just remember, Wellfield is all about nature – – enjoy the opportunity to engage with it. Keep a watchful eye and be aware of aggressive posturing by the goose; Best tip: REMAIN CALM, back away slowly – -do not act aggressive or hostile toward the geese, this can escalate the situation. If the goose sees you’re no threat, it will likely leave you alone. Enjoy the gorgeous crocus and daffodils coming up in the Spring Garden. You may notice a new white event tent on the east end of the Woodland Conservation Garden; our old tent cover was beyond repair, and thanks to our exclusive rental provider, Burns Rent-Alls of Mishawaka, we have a lovely new cover to conduct programs! I hope to see you soon at Wellfield Botanic Gardens; as the weather becomes more Spring-like, the flowers will be bountiful and our programming is just kicking into gear for the season. 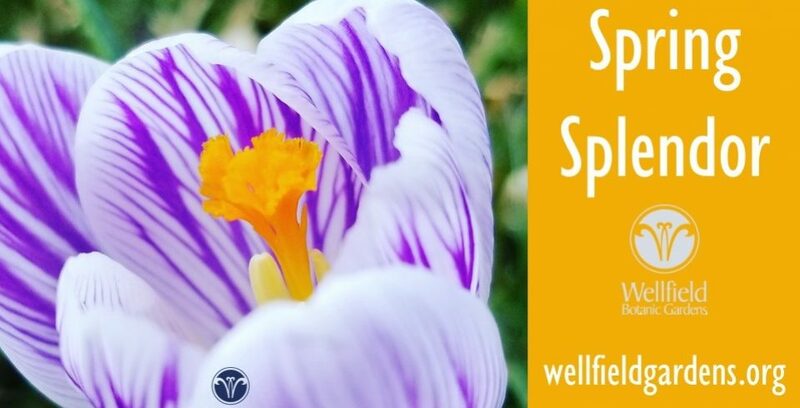 Don’t miss all the activities we have planned for SPRING SPLENDOR and thank you for supporting Wellfield Botanic Gardens! Those sycamores look just like the California sycamores here. Are they the same American sycamore that is in Oklahoma? I suppose that Midwestern plants have much larger ranges. Platanus occidentalis are the eastern sycamores here at Wellfield; the sycamores more commonly found in California are the western sycamores, Platanus racemosa. Yes, the eastern species is the more widespread of the two.